Star Wars actor Mark Hamill has said it feels “bittersweet” to be returning to the franchise for his “final chapter” without the late Carrie Fisher. Yet he said he was “finding solace” in the fact the “irreplaceable” actress would appear in the film, in unused footage from the previous instalment. It was announced last week that Star Wars: Episode IX would again see Fisher feature as Princess Leia Organa. Fisher died in 2016 after completing her work on Star Wars: The Last Jedi. In his touching tweet, Hamill shared two pictures of the two of them together: one older photo and another more recent picture – both showing him kissing the late actress. 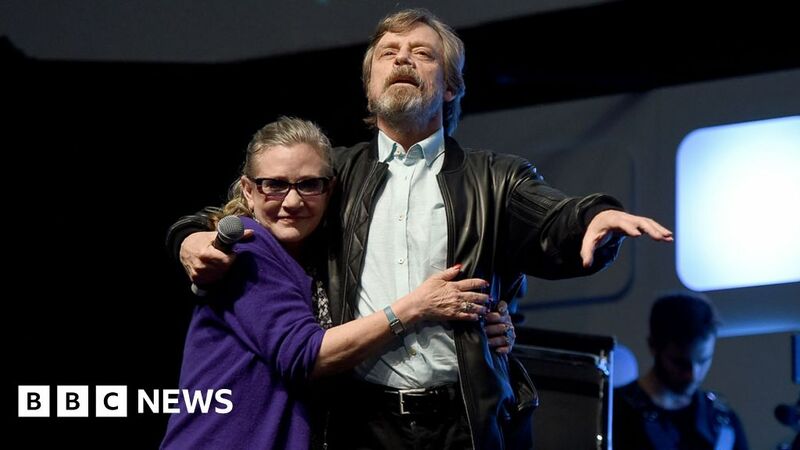 Hamill also said Fisher “would love the worldwide outpouring of affection” that greeted the news she would appear in Episode IX. The 66-year-old will be seen in the film reprising his role as Luke Skywalker, despite appearing to die at the end of The Last Jedi. Billy Dee Williams and Anthony Daniels are among the other Star Wars veterans who have been lined up to appear in Episode IX. They will be joined by new cast additions Keri Russell and Richard E Grant, who said he would be “in stellar company” when the film begins shooting at Pinewood Studios in Buckinghamshire later this week. Director JJ Abrams said there had never been any intention to have Leia played by another actress or be recreated using computer generated imagery (CGI). He said the use of previously unseen footage would allow the film “to honour Carrie’s legacy” and find “a truly satisfying conclusion to the Skywalker saga”. Star Wars: Episode IX – which has yet to have a full title – will be released in December 2019.